There’s something about travelling solo. It might be the absolute freedom of doing what you want when you want to do it, or deviating from your plans if you find something better along the way. It might be the confidence you gain from successfully navigating your way around a new city on your own. It might be the intriguing conversations you have with other travellers and locals that you wouldn’t have had if you had a travel companion. Solo Traveler, a website aimed at those who travel on their own, has published a selection of solo travel statistics drawn from a variety of travel industry studies that show there’s been an increase in the number of people who travel on their own. 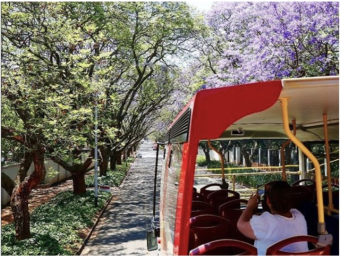 City Sightseeing’s hop-on, hop-off buses provide a safe, comfortable and informative way for solo travellers – whether you’re on holiday or on business with a day free – to explore Johannesburg or Cape Town. Just buy a ticket online, at one of our ticket offices or on the bus at any of our stops, hop on the bus, and hop off where you’d like to along the way. We’ve done the planning for you by making sure we stop at the must-see attractions in each of the cities, as well as at the hidden gems you were probably not aware of. We offer a variety of packages in Cape Town, which means you can spend up to three days on the red bus and at attractions along the route. In Joburg, we have one- and two-day tickets available that are valid on both the Green Tour and the City Tour. You can also combine these options with our add-on tour to Soweto.